Here’s the story about how this prayer ended up on this photo. First I wanted to try to capture the scene as the sun went down over the Friday night football game. This is what I call small town USA Friday nights. 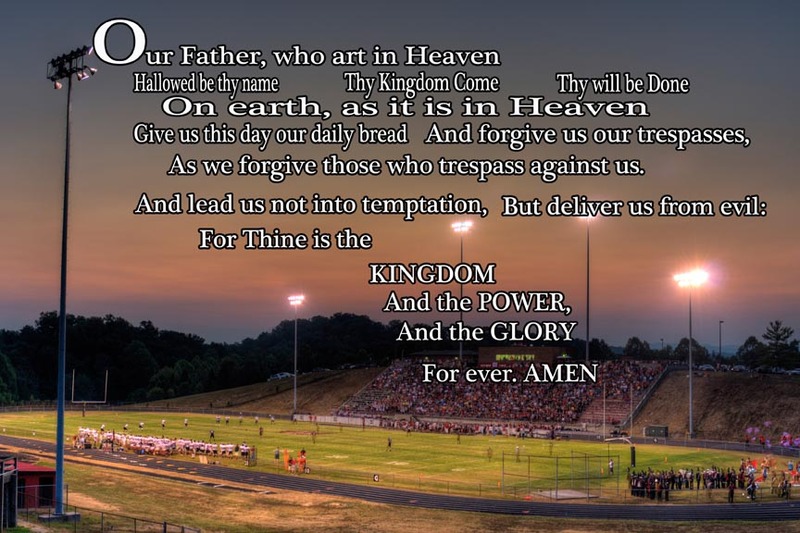 This year at the first home game and for the first time ever, they had a “moment of silence” at the start of the game instead of the traditional prayer. This upset some of the local people who responded by quietly and reverently reciting what we know as “The Lord’s Prayer” during this moment of silence. I haven’t been at the game when this has taken place but I understand that several people take part in reciting the prayer. So, that was the inspiration for adding the prayer to this photo. And I think it turned out great. I will admit I am partial to the photo and the prayer. So I love it.